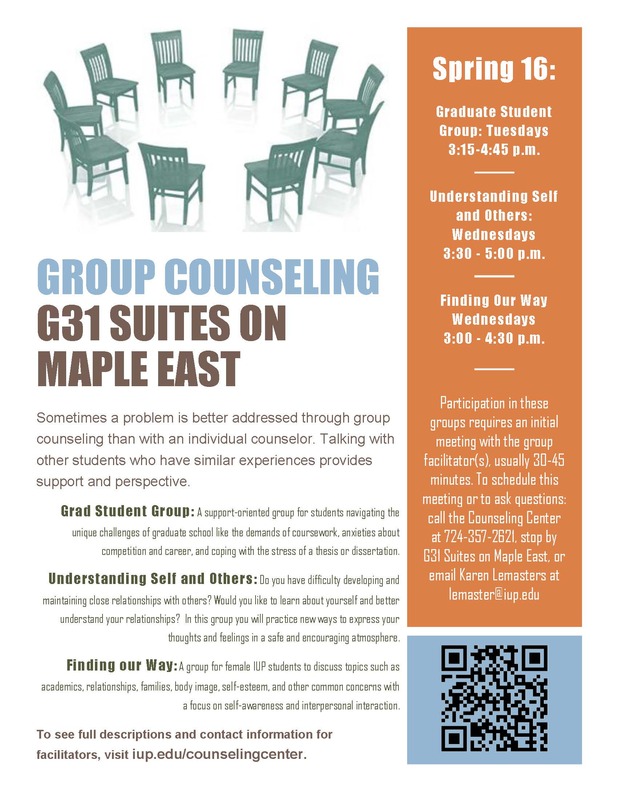 The Counseling Center at the Center for Health and Well-Being is offering the Wednesday Workshop Series. The Fall 2016 workshops address consent, body image, stress, sleep, grief and healthy relationships. The workshops begin Wednesday, September 21st at 5pm, G-60, Suites on Maple East. IUP Career and Professional Development Center Goal in the Grove! If you’re new to IUP, either as a freshman or a transfer student, plan on joining us at the “Goal in the Grove” and check out how the Career and Professional Development Center can help you in your future career plans! Find out more about how our career coaches can guide you, social media and your career search, the Student Employment Program, the Disney College Program, the National Student Exchange, The Washington Center Internship Program, resume reviews, service learning, and more! Great prizes and free food. Interested prospective volunteers are invited to attend one of two scheduled meetings listed below to learn about volunteer opportunities with Hopeful Hearts. Kathleen Regan from The Washington Center will be on campus Monday, September 19 at 6 PM in the Great Hall to speak to CHC students about internship opportunities in Washington DC. If you have a time conflict that day, she will also be holding an information session at the HUB Susquehanna Room on Monday, September 19, from 4:30 – 6:00 PM. Many Cook Honors College students have participated in an internship and educational offerings through the Washington Center over the past 16 years. Scholarships and the Cook Achievement Fund are available to help defray the cost of the program. Applicants to graduate school learn pretty quickly that admission is dependent on the ability to speak the language of the program to which one is applying. Schools want to know that you can do research, write and participate in the unique research and academic culture of their program. One way to learn and demonstrate this is to tap into undergraduate research opportunities at other colleges and universities while an undergraduate. The availability of undergraduate research opportunities was the topic of a recent seminar held by the Council of Public Liberal Arts Colleges. A liberal arts college could be your ticket to a very unique undergraduate research experience and an external credential because there is no competition from graduate students for these opportunities. If the idea of using NSE to do undergraduate research at a public liberal arts school is of interest to you, please contact Jan Shellenbarger at 724-357-2235 or jans@iup.edu. She can help you find a college that will work with you to make this happen. Priority scheduling is set for March 21, 2016. Honors College students are among those with priority registration privileges and should receive a scheduling time for the 21st – 23rd of March. If you do not receive a scheduling time on one of these days, contact Kevin Berezansky at kevinb@iup.edu. CHC students should schedule a meeting with their adviser in the next few weeks to discuss plans for the fall semester and receive a registration PIN. Don’t wait until the week before registration. Faculty time is limited to office hours and scheduling is crunch time for them. If you have questions about your honors college requirements you can schedule an appointment with Kevin Berezansky before meeting with your adviser. Please print a copy of the Honors College Curriculum to share with your adviser and explain how the CHC curriculum meets your liberal studies requirements. Hard copies will also be available on the table outside Dr. Finegan’s office. In addition to the Core Curriculum, CHC students must complete a 3 credit Honors Elective and an HNRC 499 substitution (Honors Senior Synthesis). Until we undergo curriculum revision, the following are suitable 499 substitutes: a graduate level course, a significant study abroad experience, a second CHC elective, an internship, an Honors independent study or an Honors thesis. Transfer students may be exempt from some requirements. CHC students who entered the program after their first semester of college should schedule a meeting to be sure they are meeting all their honors requirements and the Liberal Studies requirements. Subject Course Available to Honors students? ECON 356 CHC Students who need H Elect. EDSP 102 CHC Students who need H Elect. EDSP 376 CHC Students who need H Elect. EDSP 477 CHC Students who need H Elect. MUHI 301 CHC Students who need H Elect. The US-UK Fulbright Commission opens applications today for the UK Summer Institute Award Programmes for US Undergraduates. The Fulbright UK Summer Institute Programmes offer students a fantastic opportunity to be immersed in the study of British academics and culture. Students will take part in research, collaboration, presentation, and cultural events at an esteemed British university. They will enhance their leadership skills, develop knowledge and understanding of new subjects, and become ambassadors for the United Kingdom and the United States.